I gotta admit, Lilo and Stitch wasn’t one of my favorite Disney movies growing up, though it did have its cute scenes (see below). Surprisingly, I did really enjoy the spin-off television series that followed a few years after. Stitch is an energetic alien who crashes on Earth and finds a home with a Hawaiian family and befriends Lilo, a sometimes lonely little girl. As alien bounty hunters begin hunting for Stitch, Lilo tries to train him and teach him the meaning of family (ohana). Based on the well-known scene of Stitch eating cake and then “sharing” it with Lilo, I baked a chocolate cake! 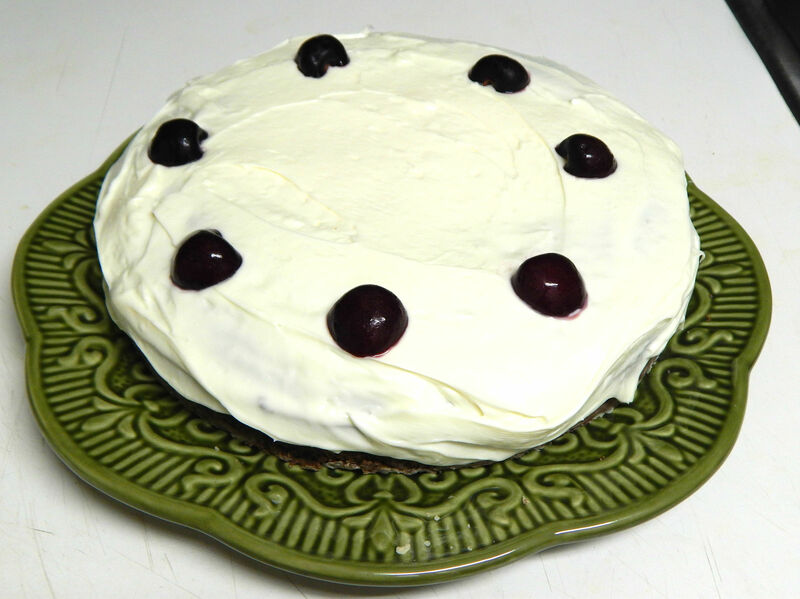 I used my go-to chocolate cake recipe, and topped it with vanilla frosting and sliced fresh cherries. No regurgitation necessary. It was good luck that I decided to take a picture immediately after frosting it. Our air conditioner broke over the weekend, so the southern heat was ridiculous, even indoors. Because of this, the frosting melted and slid off just after a few minutes of sitting at room temperature. But it still tasted good! I haven’t thought about that movie in so long! Stitch was pretty cute…. The cake looks great, melty icing and all! I just rewatched Lilo and Stitch and loved it a lot more than I did when it first came out. It’s just soooo freaking cute and it’s so awesome to see a non princess, not rich, rowdy little girl protagonist. the cake scene is great!